is immersed in the ingredients in the container where they are being prepared. They are small, convenient, easy to use, and easy to clean appliances with many cooking uses. What is a hand blender used for? What is the difference between a hand blender and a hand mixer? A hand blender chops and pureés foods but a hand mixer only mixes ingredients. Mixer beaters (right) are meant for mixing ingredients whereas a hand blender blade (left) is small, sharp and rotates at much higher speeds in order to liquify ingredients. A hand blender with the right attachments can be used for most of the jobs that a hand mixer does but not vice versa. So, why would you choose a hand blender over personal/countertop blenders? Hot liquids – hand blenders handle hot liquids better because their the motors are above the hot liquid. Only the blade is immersed. Personal and countertop blenders have motors below the liquid. A seal normally protects the motor. Because this seal can be damaged by the hot liquid can drip down into the power base where it can cause damage to the motor or other electronic parts. Cleaning – wash the blade under the tap in the kitchen sink. This is the only part that requires cleaning. Most hand blenders have a detachable blade unit that is dishwasher safe. Size – due to the smaller size of a hand blender there is more room on your countertop for meal preparation. A hand blender saves valuable cupboard storage space due to its small size. Most hand blenders will fit in a drawer. Cost – although there are expensive hand blenders available on the market, generally hand blenders cost less than personal and countertop units. Size – although an advantage in certain cases, the small size is a disadvantage when it comes to making large quantities of anything. A hand blender takes much longer to make several small batches than a countertop blender to make one large batch. Power – is needed in addition to size in order to blend large quantities of hard, whole food items. Mess – blending with a hand blender raises the potential of creating a mess. The blade must remain immersed whenever the unit is on. If you pull the hand blender out of a liquid mixture while the blade is still spinning, well, you can imagine what a mess you can make of your kitchen and yourself in a hurry. I call it the “splatter factor”. And what would happen if the liquid mixture is a hot soup? In short, immersion blenders are small, less expensive, easier to clean and excel at blending hot foods like soups, pureés, and sauces. But, when it comes to quantity and power this is where personal and countertop units start to shine. The KitchenAid KHB2561 5-Speed is my top pick for the best small kitchen hand blender. Its 5-speed dial distinguishes this hand blender from the others and gives it more versatility than single or 2-speed models. Different blades are available including the S-blade for blending, the multi-purpose blade for crushing ice and a frother/beater blade for frothing milk. Change all of the twist on-off bell blade assemblies without tools. The package includes a whisk and a chopper attachment. It has a 5-foot long power cord giving it a large work area. A convenient 4-cup (1 L) BPA pitcher and a storage container accessory organizer are included. Click the image below to learn more on Amazon about this great little immersion blender. Need deeper reach? 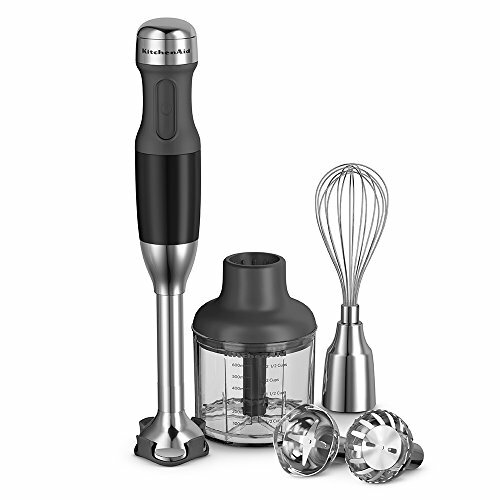 A 13″ blending arm is available on the KitchenAid KHB2571 model hand blender. Want to find more choices? Click the following link to read my page, Immersion Blender Reviews. Thanks for staying and reading down this far. Here’s a couple of great recipes you can make using your favorite hand blender. 1. Place the onion and celery in the chopper attachment bowl of the KitchenAid® Hand Blender. Secure the chopper to the hand blender. Chop on low speed 4 for 5 seconds or until finely chopped. Set aside. 2. In a large stockpot, heat the olive oil over medium heat and add onions and celery. Sauté until vegetables are soft and begin to brown, about 10 minutes. 3. Stir in garlic, dried and fresh thyme, parsley, salt and the peppers for 1 minute until fragrant. 4. Add broccoli and potatoes, stir to combine. 5. Pour in milk, half and half and chicken stock, bring to a boil. Cover and simmer for 15-20 minutes or until potatoes are fork tender. 6. Remove from heat. Attach the multipurpose bell blade assembly to the blending rod and blend soup at speed 2, rotating blender within the stockpot to pureé to a smooth consistency. 7. Add shredded cheese and stir until fully incorporated and melted. Combine the whipping cream through powdered sugar in the BPA-free pitcher of the KitchenAid® 5-Speed Hand Blender. Attach the frother/beater bell blade assembly and froth on speed 4 until thickened. Pour coffee into two tall mugs and top each with 1/4 cup cinnamon whipped cream. Garnish with 1/8 teaspoon cinnamon if desired. Do you have any hand blender recipes you’d like to share? Post them below in the comments section. Or, if you have any comments or questions about hand blenders, please feel free to post them below. I LOVE my kitchenaid hand blender! I have been wondering if I can use it like a handheld mixer though. I saw you had a section on it, I want your opinion though! Do you think I could use my handheld to mix cake batter? I want to make a small batch of cupcakes and don’t want to pull out my big kitchenaid, so I’m curious to know if the hand blender would work. Have you tried it? Do you think it would get the same smooth consistency? I absolutely love using my hand help blender for making mashed potatoes, it makes them so creamy, and it doesn’t hurt my hand! Also, your broccoli cheddar soup looks so yummy! I really hate thyme though, do you think it would still taste great if I omitted that? Thanks so much! The simple answer to mixing cake batter with a hand blender instead of a mixer is yes, you can. The more complicated answer is that there is a trick to it. You will still have to hand mix or whisk the dry ingredients and wet ingredients separately. If you have a hand blender with a whisk attachment, like the KitchenAid KHB2561 5-speed hand blender, then you can use the immersion blender with the whisk attachment to mix the wet ingredients. Read my Immersion Blenders Review page for more information on this hand blender. Then add 3 to 4 heaping tablespoons of dry mixture into the wet mixture and mix using the immersion blender. Mix until the ingredients are smooth, no lumps. Continue adding 1 tablespoon of dry ingredients at a time and blending until all of the dry and wet ingredients are thoroughly mixed into a consistent, smooth batter. It is not a good idea to try to use a hand mixer as a hand blender though, unless you have a separate attachment. The beaters are designed to mix, not to emulsify ingredients. Also, imagine the mess if you try to blend hot soup with the uncovered beaters. Yuck and Ouch! Lol.